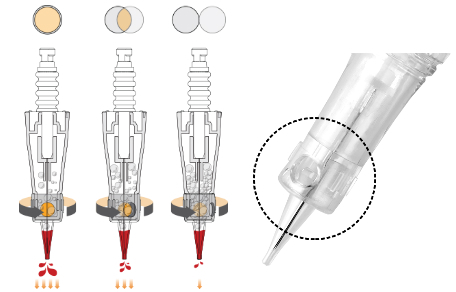 Revo needle cartridges are EO sterilized disposable needle cartridges with new patented technology that allow for the adjustment of pigment flow through the needle cartridge. Adjust the amount of pigment emission by turning the adjustment ring. No other needle cartridge in the world have this capability. All devices below use Revo needle cartridges with adjustable needle depths. Before placing an order, please make sure the needle cartridge will fit your device. We cannot accept returns of opened needle cartridge boxes due to safety reasons. If you have any questions please CLICK HERE, we will be happy to assist you.